In any campaign the power of social media should not be underestimated. This became apparent during the construction workers BESNA dispute of 2011. Facebook groups such as “Sparks Against De-skilling and 35% Pay Cut” were set up and were used as outlets to get the latest information and news out to thousands of workers. They also gave construction workers the opportunity to have mass discussion and debate even though they were spread the length and breadth of the UK. This dispute also saw the birth of the “Electricians Against the World”(now “Site Worker”) blog which was created by a rank and file electrician using the pseudonym of “Jib Electrician”. Logs show that the blog was visited by the employers, politicians and police on an almost daily basis during the dispute as the information shared on the blog and Facebook group included dates and times of protests and demonstrations. When the organisers of the blog and facebook group realised how much the employers and police were keeping an eye on their activities another tactic was used to cause disruption and panic. False information was drip fed on the social media outlets, for instance, in one case a question was posted on the facebook group asking “Does anyone know if Unite are paying for travel and accomodation for the protest at the Beauly Substation on Wednesday?” It came to light a couple of days later that the site management had asked the guys to start at 6am in order to avoid the BESNA protest at the site gate. 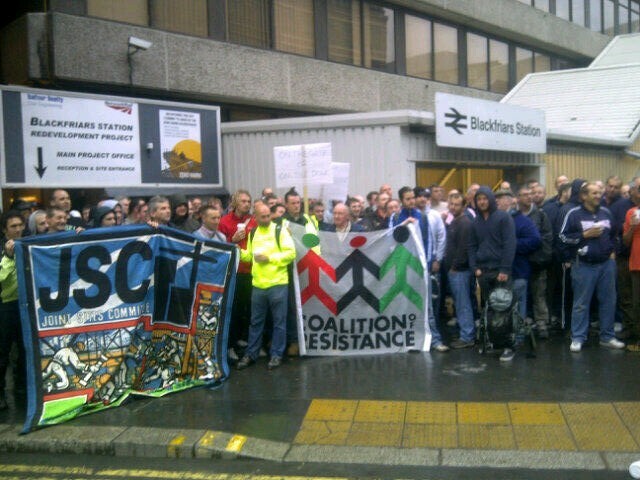 Another example of false information was when there was a protest at the Balfour Beatty Engineering Services head office on the outskirts of Glasgow, while there, activists started to post on the Facebook groups that they would be moving to construction sites local to where the original protest was happening. This resulted in the police being called to one particular site and the gates shut in anticipation of the rank & file protestors arriving and occupying the site as had happened on many other occasions during the dispute across the whole of the UK. Thanks to the Facebook groups and meetings which were happening all over the country on a regular basis, a construction rank & file contact database has been established of email addresses and mobile numbers. Added to that the campaign Facebook group has over 3000 members so through the group, blog, email and text messaging we are potentially able to reach 6000 construction workers. The victory over the BESNA rogue employers was delivered by building the rank & file network and co-ordinating action up and down the country and it can work in the same way for all workers from any sector. The tip from this is, that a good social media presence can be one of the most important tools that activists can have, why do you think the Tories have included social media restrictions in the Trade Union Bill? You can join the Sparks Against De-skilling Facebook group. Follow the Site Worker blog. This entry was posted in Tips and tagged Industrial Action, Leverage, Mobile and Remote Workers, Organising Techniques. Bookmark the permalink. I know in other campaigns, most notably BASSA / BA Cabin Crew, management trawled social media and even private forums to gather evidence about activists which was then used to victimise them. Was this an issue in the BESNA campaign? How did you avoid it? We didn’t avoid it Ian, we just faced it head on by naming and shaming the employers and their tactics on social media and also with direct action on their sites and at their client base too. Of course, the art of deception is a useful tool also. We’ve taken great inspiration from the sparks and Besna on the social media front and thank them for showing us how to use it so successfully.